SHANACHIE (Sha-na-kee): a Celtic word that means "Storyteller". In days of old, the Shanachie traveled from town to town recounting tales of the land to young and old. Shanachie is now the name of a musical group, the members of which are renowned for their ability to weave stories through their songs. Their unique style of folk music tells tales of people, legends, lands, and eras from long ago with a timeless appeal. They are an exceptionally versatile group who also play American folk songs, rock'n roll, country, and even funk rap. They posses the rare capacity to entertain the entire family---from the grandparents to preschool children. Since its formation by Jim Rivera in 1979, Shanachie has performed for over seven million people. In addition to its performances for more than 500,000 school children, the group plays regularly at hospitals, senior citizen's facilities, universities, corporations, and also at many festivals throughout the world. Shanachie has worked with such well known artists as Judy Collins, a top female recording artist; country-western singers: Leroy Van Dyke, and Tom T. Hall, John Stewart, Dan Seals, and Riders in the Sky, and comedian, Henny Youngman. Shanachie has toured Canada and the United States, performing extensively up and down the west coast and Arizona. The group also traveled abroad, playing to audiences in many European countries, Great Britain, the Faeroe Islands Denmark), and Iceland. In July 1988, Shanachie was selected to represent the United States at the Millennium International Folk Festival held in Dublin, Ireland. This distinctive honor was warded to Shanachie for its exceptional talent and its promotion of folk music in the United States. The tremendous success of the performance in Ireland, and other performances all over Europe, led to an official invitation from the Turkish Music Foundation. In August 1989, Shanachie presented its repertoire at the most prestigious of Turkish folk festivals, the International Dance and Folk Festival, in Istanbul, Turkey. Once again, Shanachie represented the United States with great honor and pride. In 1990, Shanachie traveled to Mohnessee, Germany, and actively participated in International Music Week by giving several lively and entertaining performances. 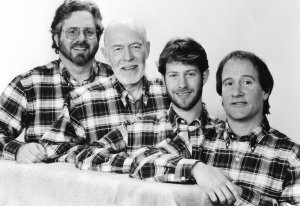 In 1991, "Shanachie" was invited to participate in the Waldkriaburg Music Festival in Bavaria, Germany with groups from nineteen other countries and then returned to Mohnessee, Germany in 1992 for an encore presentation performance. Shanachie also made two tours of Germany and Luxembourg in 1992, the first encompassing 35 venues in 43 days (30 cities) and the second, 41 performances in 45 days (39 cities). In 1992 Shanachie performed in and International Festival in Luxemburg. In September 1993 "Shanachie" participated in an "International Friendship Festival" in Moscow Russia and performed in seven cities as well as appearances on Russian Radio and TV. Shanachie has recorded three albums: Shanachie, Shanachie Volume II, and Shanachie Volume III. (These albums are available by contacting Shanachie, Inc.). These albums have received air time in over 45 countries on 100 or more radio stations. "Shanachie" includes in its credentials, appearances on NBC (1989), CBS (1992) and National TV in five European countries in the past five years (their own one hour feature performance "With Love Shanachie" has also been broadcast on 72 cable access stations throughout the U.S. as well).